John Dueckman – Page 2 – "in-approval"
Providing extensive guidance, advice, support, project management, and consultative expertise in any and all things CA Endevor SCM. Encompasses comprehensive knowledge of z/OS change and configuration management with extensive experience in best practices. Some time ago, I polled the Endevor community to discover who might be using Endevor to manage and control the changes that the systems programming area does. This document contains the original question and responses (without editing aside from removal of name and company). I thought you might find the content interesting and thought provoking….! “You must be kidding! I consider myself lucky that I get to assemble my own routines (C1DEFLTS, BC1TNEQU, etc…) in Endevor and have them copied to the systems libraries so I have footprints to check when things go south. Besides don’t you know that the SMP installer does its own configuration management? (at least that’s the excuse the systems programmers give me). “Hi John, I am one of the systems programmers here at xxxxxxxxxxxx and the Endevor Administrator and there is no way that I would put our systems under Endevor. I can’t say that we would enjoy bringing Endevor into the mix if we had a problem with a parmlib member during an IPL. “Most in-house written exits, batch jobs etc. used by systems programmers are under the control of Endevor. We also store alot of the parmlibs, syms, includes etc. under Endevor. In addition, we have a couple of pieces of software managed by Endevor as well. 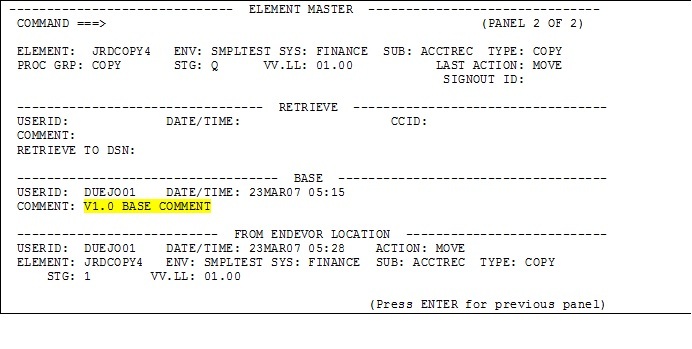 For example, we use Endevor to manage the Endevor software. A new release gets installed in a development environment. Then, we load all modules associated with the Endevor software into a Product Environment and use Endevor to migrate the new release through the testing state and onto production. This same philosophy is used whenever a PTF is applied to Endevor. We apply the PTF in development, migrate any changed load modules, source etc. through Endevor into our test states, test the ptf, then move it on to Production. This also helps use to track any changes we have made to panels, defaults table etc. “I’m not sure what all you include in ‘system’ programs. Because most state agencies use xxxxxxxx, I think any true systems programmers (that work for the state) would be there. “I have joined the wonderful world of consulting, so bear in mind that the information I am providing is from past employers, but I thought it might be helpful or useful if you get a low percentage of responses. At xxxxxx, the z/OS team leader wanted all items under Endevor control. We had entries for just about all aspects (including SYS2 and SYS3 libraries – all CICS regions’ JCL, control cards etc.) except SYS1 libraries. We were working towards converting all components of both in-house and purchased software tools (i.e. programs, JCL, control cards etc.) to Endevor. Unfortunately, the bank was bought by xxxxx before we were able to complete that transition. 😦 Keep in mind that the Endevor administrators (myself included) were systems programmers and reported directly to the z/OS team leader who also served as our backup – in the event we were unavailable. My manager’s exposure and high level of comfort with the product played a major role in driving the team to get systems components under Endevor control. Everyone had to learn how to use the tool – no excuses. “The issue we’re facing, as I see it, is around resistance of change to existing work practices by the Host Systems group and what they see as an ‘intrusive’ solution that requires effort to configure. Our ‘competitor’, xxxxxxxx, purportedly does not require them to change the way they work. You define the libraries/datasets to be monitored and audited and it just sits there tracking activity. Then when you want to report on access and change you run the report and ‘”hey presto”. Also, if you wish to rollback to an earlier version/backup it provides this capability. The real clincher selling point (it seems) is that it was written by a System Programmer for Systems Programmers (this has been mentioned to me a couple of times). 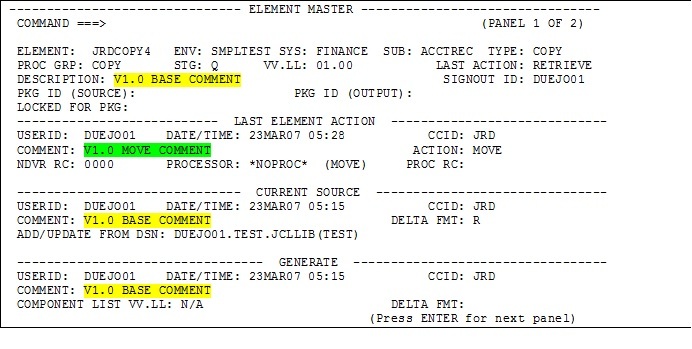 The following article is specific to a tool from IBM known as Enterprise Generation Language. I provide the information not so much as a solution specific to EGL but rather as a model on tenets I believe are critical to effective source and configuration management for z/OS systems, the main one being “ultimately, the TRUE source (not just the generated source or derived source) needs to be captured for auditing and management purposes”. It’s not good enough for “models” on distributed platforms to be “the source” and then import what it creates in its completeness as an application; I believe to truly safeguard an application on z/OS, I must be able to recreate that application from the “stuff” I’ve stored… and my place of storage for applications is Endevor. 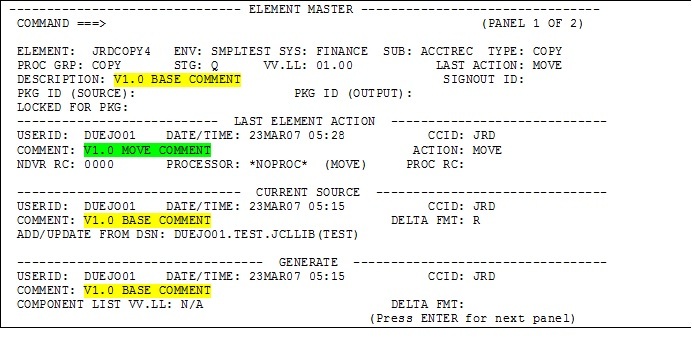 In the past, I was asked to investigate the options in integrating Enterprise Generation Language (EGL) for z/OS from IBM into Endevor. What are the choices that an Endevor site has in securing applications so that the same integrity Endevor gives to “native” code can be secured in “generated” code? 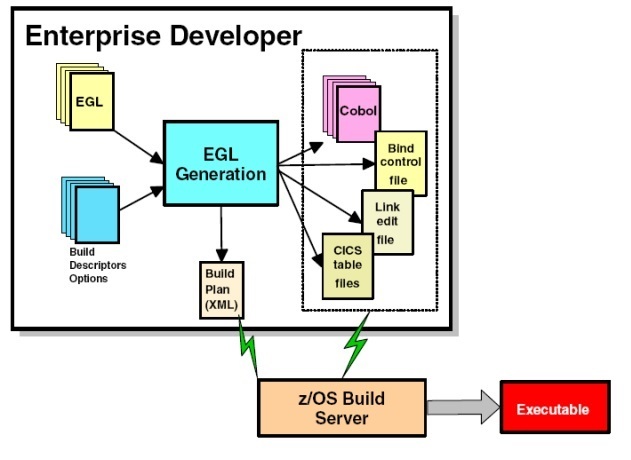 Unlike other CASE tools that generate code for execution on the z/OS system, the EGL ecosystem requires the target language to be generated on the workstation. 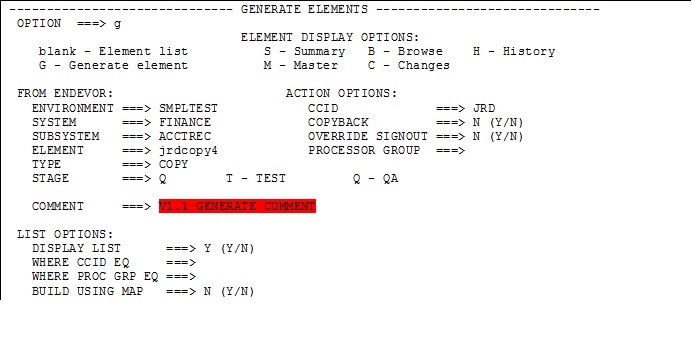 Other CASE tools (such as CA GEN) provide the option of generating the code on z/OS. One of the “choices” during COBOL code generation is to have the code automatically delivered, compiled, and otherwise made ready on z/OS from the Enterprise Developer on the workbench. Note in this flow that at one point you can specify PREP=Y. This instruction on the workstation causes the generated COBOL, JCL, and if necessary, BIND statements to be transferred to the mainframe for execution. Otherwise, all built routines remain on the workstation for delivery to the z/OS platform based on how you want to send it there. All sites contacted or from whom I have been able to get information have indicated that they are storing their EGL source in a distributed solution (either Clearcase or Harvest) and are storing the z/OS source in Endevor. The mechanism for storing the generated source in Endevor (i.e. manual or automatic) has not been determined. Given the fact that sites ARE saving something that is referenced as EGL source and storing it in their distributed solution, this gives evidence (as well as reference in the EGL manuals) that there IS EGL source that needs to be stored. 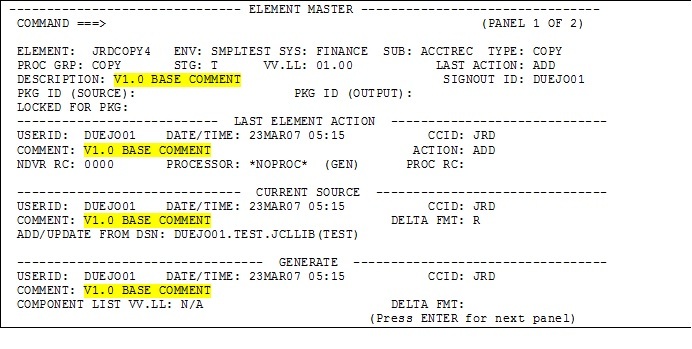 Is there a name or label or title or something in the EGL source that correlates to the generated z/OS elements? This is key to providing a quasi-automatic solution. EGL in Distributed Solution/Manual delivery of z/OS components. This option appears to be the most prevalent amongst those sites that are using EGL. Note that one of the other indicators from my research is the lack of sites using or implementing EGL at this time. While this may change in the future, there is limited experience or “current designs” to draw upon. This solution would, as the title implies, store the EGL in a distributed SCM solution, do the generation on the workstation, FTP or otherwise transmit the generated source to the mainframe, and then ADD/UPDATE the source into Endevor for the compilation. 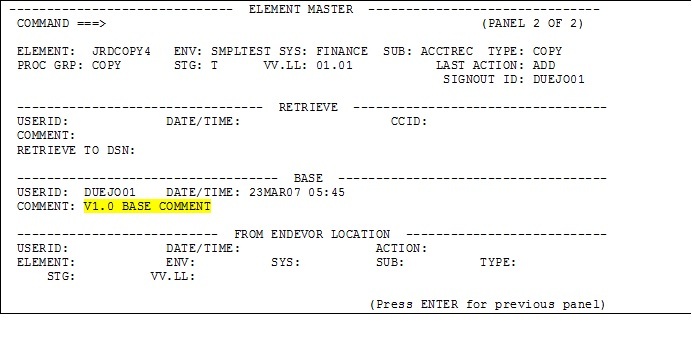 Note that the transmission of the source generated on the workstation and the ADD/UPDATE of the source into Endevor can be accomplished today without signing onto the mainframe by accomplishing this step through Change Manager Enterprise Workbench (CMEW). In this scenario, the EGL would still be stored in the distributed SCM solution. However, if you specified PREP=Y, then the source would automatically be delivered and compiled by and in Endevor. This scenario would require research and modification of the IBM provided z/OS Build Server. Based on the research conducted to-date, the z/OS Build Server is a started task that invokes the site-specific compile, link and bind processes. This process could, theoretically, be modified to instead execute an Endevor ADD/UPDATE action that would result in the source automatically being stored and compiled/linked/bound by Endevor instead of the “default” process provided by IBM. In this scenario, the z/OS generated components remain on the workstation. 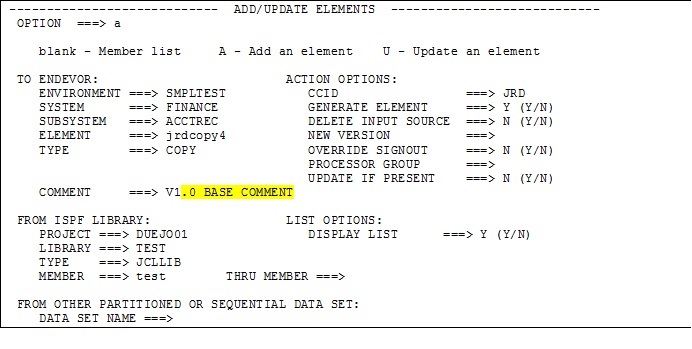 All components, including the EGL source, COBOL source, link statements and anything else created by EGL, are then merged into a single “element” with each different type of source perhaps being identified with a separator line of some sort (maybe a string of “***********”). The ADD/UPDATE process of Endevor would then execute the different source components through their appropriate compile/link/bind programs as appropriate i.e. the first step in the processor would create temporary files that unbundled the different source types. These temporary files would then be the source that is generated. Note: In order for any of the following designs to work, discovery of the previously documented “unknown” must be determined. These designs will only work if there is “something” in the EGL source that can be directly tied to generated z/OS components. In this scenario, code generation would take place on the workstation and PREP=Y would execute as provided by IBM with no modifications (other than site-specific ones) to IBM’s z/OS Build Server. 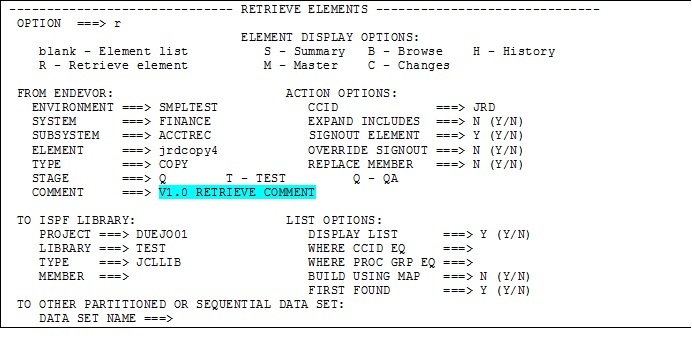 This will result in the COBOL, link, and BIND source being delivered to PDS on the mainframe and compiled there. Assuming the delivery of the components to z/OS can be done to “protected” libraries, the EGL source could then be ADD/UPDATEd into Endevor using CMEW. 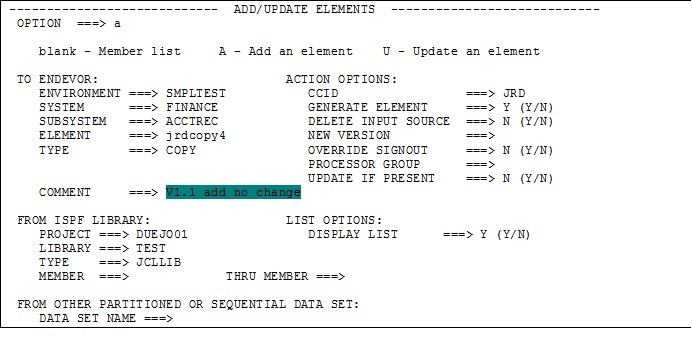 The ADD/UPDATE process would then query the EGL source and automatically copy or otherwise bring in the COBOL, Link, and Bind source created and delivered earlier. The load modules created would be ignored; they would be recompiled again under Endevor’s control. There are a variety of other options and designs and hybrids/combinations on the above ideas that I can think of. However, this paper should serve as the beginning of a discussion concerning which model or architecture best suits the needs of the site. A very helpful hint for the Endevor Administrator is to have a second userid for the system that has limited access to facilities along the same lines as the most restricted developer. This ID is very useful for ensuring the changes you make in Endevor work for everyone. Your normal userid tends to have “god-like” access to everything. Therefore, everything always works for you! The “dumb ID” reflects your users and is a good verification check to ensure changes you are making truly are “transparent”. It is surprising how many sites are unaware of the excellent support provided by CA for all of its products through the Internet. Everyone using CA products should be registered and using the facility found at supportconnect.ca.com. Through effective use of supportconnect, the Administrator has an opportunity to be more than just “reactive” to Endevor problems; they can actually be “pro-active”. For instance, supportconnect provides the ability to list all current problems and fixes for the Endevor product. The Administrator can scan down that list, recognize circumstances that fit his/her site, and apply a fix before the problem is actually encountered. Conversely, they can sign-up to be alerted to times when new solutions are posted, thereby being made aware of problems and fixes without even having to request a list. Other features of the tool are the ability to create and track issues, as well as your site-specific product improvement suggestions. One of the struggles companies often face with Endevor is trying to define where the administration for the system best resides. While not offering a definitive answer to this question, I provide the follow excerpt from a report written for an Australian firm where I have endeavored (no pun intended) to provide at least some opinion. Development – this is one of the best areas for Endevor Administrators to be physically located, because they are working with their principal stakeholder. The major drawback with belonging to this reporting line is that they are responsible for maintaining company standards and procedures, which can potentially be compromised by a management request. Care must also be taken here to take the role seriously, because it usually decays into a caretaker or part-time role that no one is really interested in. Even though Endevor Administration is within the application development structure, developers should not be the ones managing Endevor. Change Management / Operations – usually set up as a discrete business unit within Operations, Change Management walks the balance between maintaining corporate standards and being attentive to developers’ requirements, but with reduced risk of compromising their responsibility through a management request. Sites that select this option will usually have full time resources committed to the role, and consequently enjoy the benefits of that decision. Systems Administration – although a realistic choice through technical requirements, positioning Endevor Administrators within this area is the least advantageous. The risk here is that they will see their role as enforcers of process first, before they take developers’ requirements into account. Traditionally they will not commit full time resources to the role, so users will miss out on features and functionality as new ‘best practices’ emerge. In summary, the optimum could be to physically locate the Endevor Administrators with application developers, but their reporting line could be to Change Management / Operations or even Audit. No matter where Endevor Administration is located and what the reporting line, it is most important that the role is full time and taken just as seriously as that of the System Security team. A good practice to get into is to regularly review the values and “switches” that have been placed in the Optional Features table supplied with Endevor. The source is found on the installation TABLES file and is member ENCOPTBL. 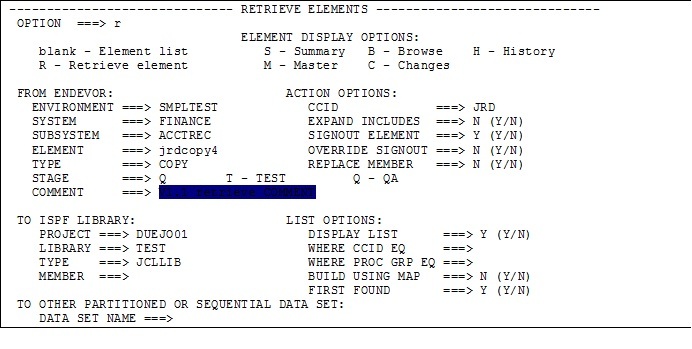 Each optional feature is documented as well as the various parameters that may be provided when activation the option. Endevor processors allow you to iteratively invoke Endevor from within Endevor. This is a common practice when you need to retrieve something related to the element being worked on in a processor. For instance, you may want to check the submission JCL against the PROC being processed, or perhaps component information is needed to ensure complete processing occurs. Before deciding to include “Endevor within Endevor (C1BM3000)” in your processor, make sure what you want to do can’t be done with one of the myriad of utilities specifically designed to execute in processors. Specifically, CONWRITE has had many extensions added to it that allow retrieval of elements and retrieval of component information. A utility will always execute neater, cleaner, sweeter, and faster than Endevor-within-Endevor. 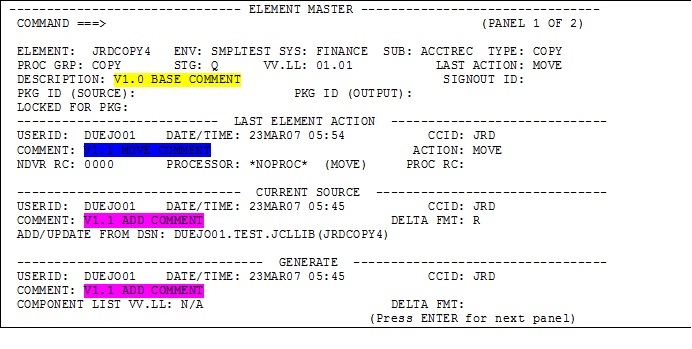 A very simple technique to improve Endevor performance and reduce the number of service units required by the facility is to move (or copy) commonly used JCL statements from the processor to the submission JCL. Specifically, either move or copy the declarations for SYSUT3, SYSUT4, SYSUT5, etc. into the skeleton member XXXXXXX so that they are defined automatically by the OS390 operating system at submission time. 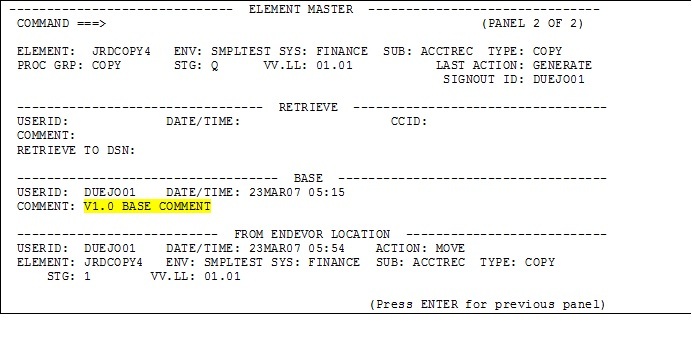 Then, when Endevor requires the DDNames and allocations, they are already done, thus saving overhead time required for Endevor to perform the dynamic allocation. While this does not sound like a “big deal”, in actuality it can make a significant difference. 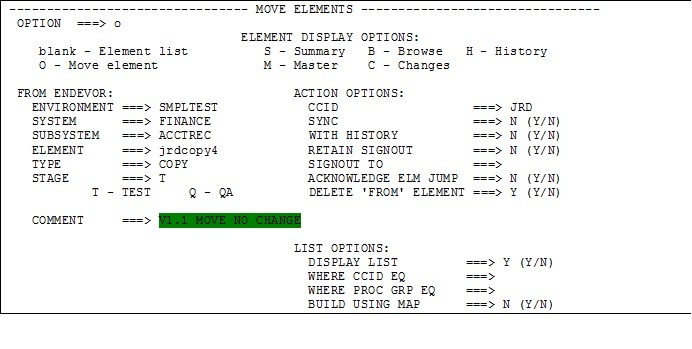 A typical COBOL processor, for example, will need to allocation each of the SYSUTX Ddnames twice; once for the compile step and again for the linker step. 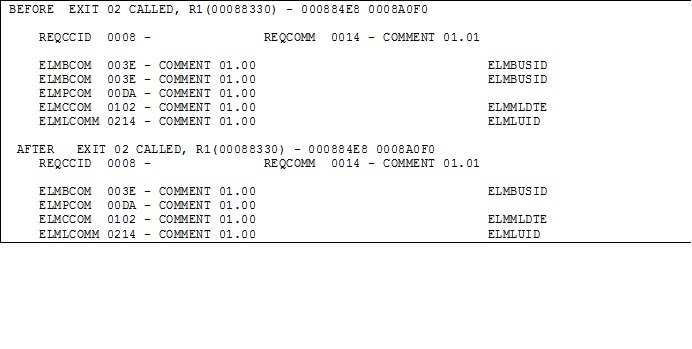 If you are compiling 50 programs in an Endevor job, the allocations and de-allocations can occur over 300 times! Based on personal experience, I would put the SYSUTX statements in BOTH the processor and the submission JCL. This is based on experimentation done that established a baseline CPU usage with the statements just in the processor. 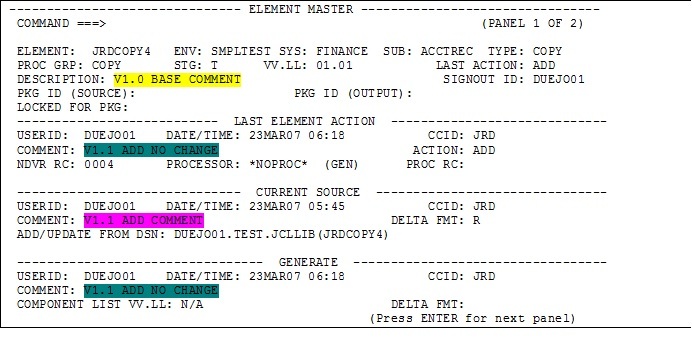 The first alteration removed the statements from the processor and placed them only in the submission JCL. This resulted in a drop in CPU usage. 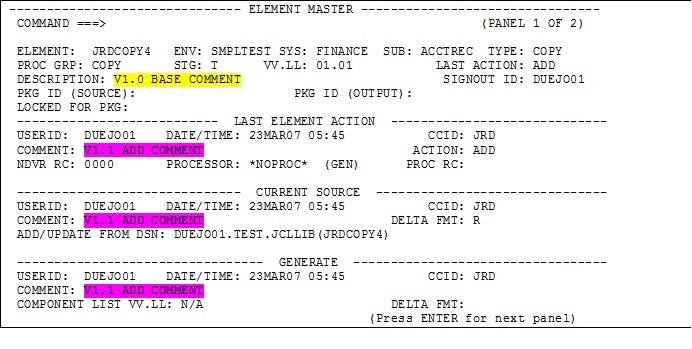 I then placed the statements in both the processor AND the submission JCL. This resulted in a further drop in CPU usage (lower than the first!). Therefore, no harm is done (in fact, good may be the result!) by having the statements in both locations, so I would leave it in both! 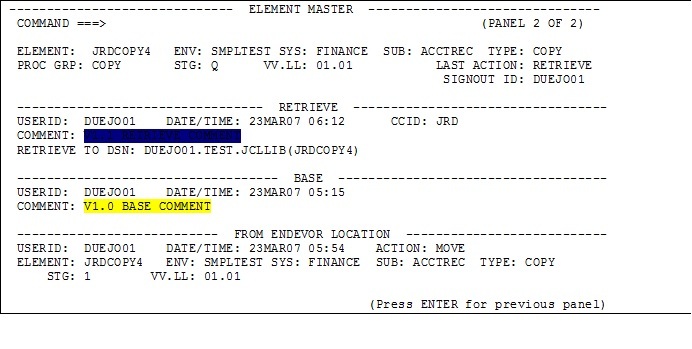 One of the problems with the Endevor documentation is that the different traces (and “hidden abilities”) that are available are scattered throughout different sections. Therefore, this list has been (and is being) constructed to try to capture all the different traces in one location. Take the time to search through the manuals looking for “EN$”. You might be surprised at the things you discover that you never knew you had! “The security look aside table (LAT) feature allows you to reduce the number of calls to the SAF interface and thereby improve performance. The result of each resource access request to SAF is stored in the LAT. 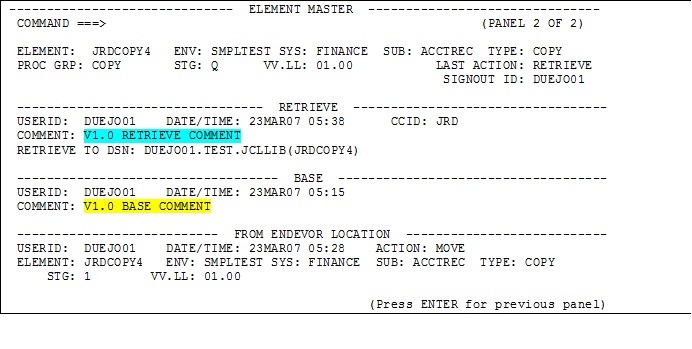 ESI checks the LAT first for authorization and if the resource access request is listed ESI does not make a call to SAF. Always ensure you have allocated a value to the LAT variable in the C1DEFLTS table as this is a simple (and supplied) manner of improving Endevor performance. Leaving the value blank or assigning a zero to the field will turn the function off, resulting in superfluous calls to your site security software during foreground processing. The values that can be assigned to the LAT field are 2 to 10, with each number representing 4K page sizes of storage. A good starting value is 4.